A stick clip is a long pole with a clamp on the end typically used by sport climbers to clip a draw to the first bolt on a climbing route. it is sometimes called a clipstick. 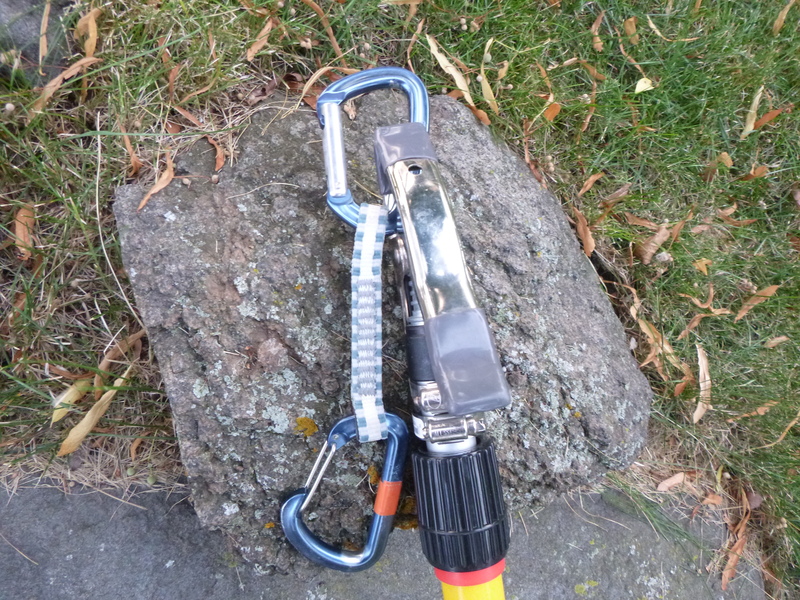 The stick clip makes climbing a sport route safer because the climber is essentially on a top rope until they get to the bolt. That way, if the climber falls, they won’t hit the ground. This article explains how to build a stick clip and put it to use. 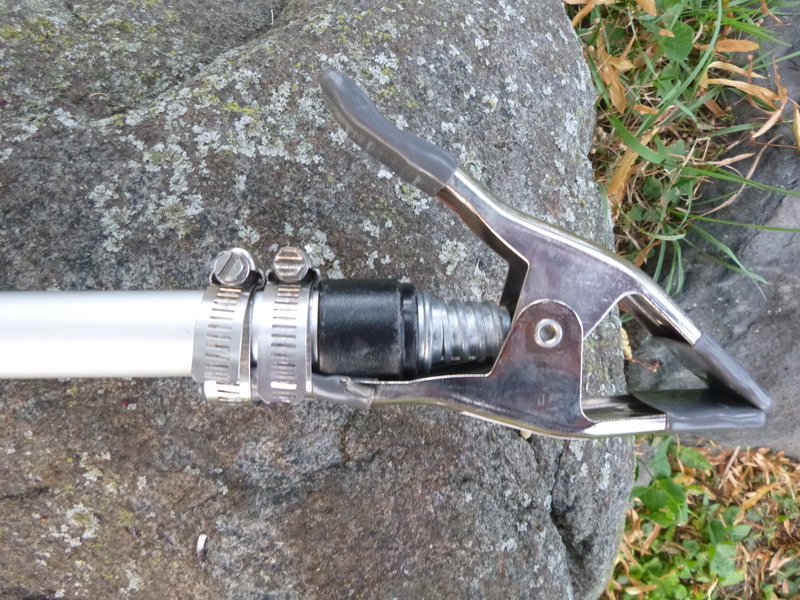 Buy an extending painter’s pole (I like the 6-12′ Mr. Long Arm ), a 2″ spring clip, and two 2″ hose clamps. If you want to save money replace the painter’s pole with a broomstick and the hose clamps with tape. Note about the painter’s pole: The Mr. Long Arm I use is too long to fit in my car without the back seat folded down. If four people are in the car we bungee cord it to the roof rack. This works just fine for me but it might not work for you so measure what will fit in your car before buying. 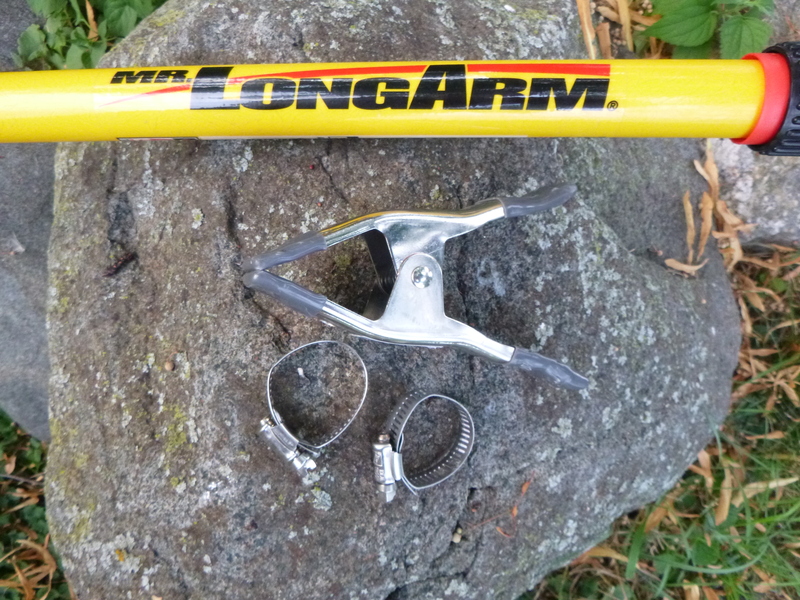 If you need a shorter pole Mr. Long Arm is available in 3 to 6 foot and 4 to 8 foot versions. 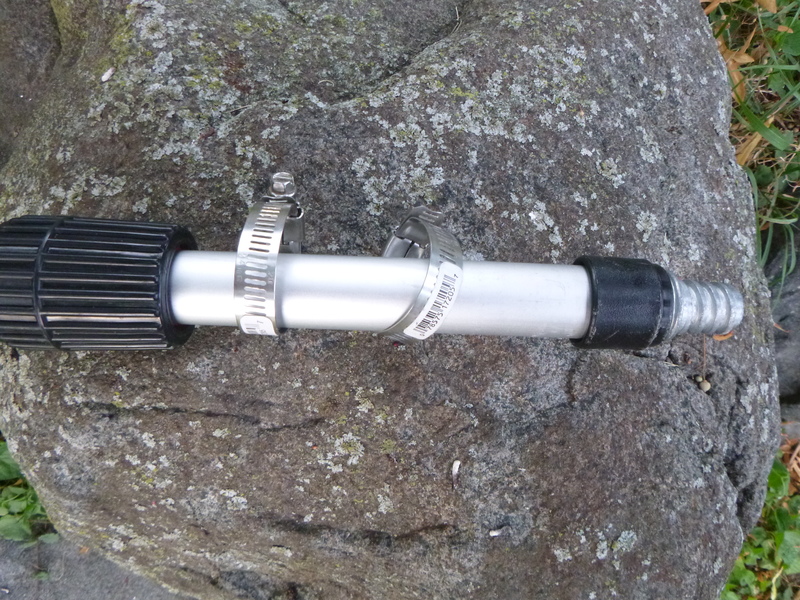 If you want to go all out replace the spring clip with a Trango Squid for about $30. While the spring clip can only put up draws with the rope already clipped, the squid clip can do this plus two other things. The squid can clip draws to the wall just like the spring clip. The squid can also unclip draws from the wall (great if you couldn’t finish the route and want to get your draws back). The squid can also clip a rope to a draw that is already hung on the wall (great for walls with draws hung permanently – permadraws – or any other time a draw is already up). The squid threads on and off the pole rather than being held on by hose clamps. First put the hose clamps on the pole. Slide the hose clamps on the pole. Then slide the hose clamps over the spring clip. Line them up so that they are inside the spring clip so that they don’t keep the clip from getting as close as possible to the rock. Tighten them and your stick clip is ready to go. 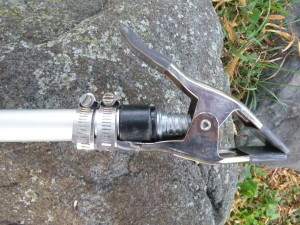 Use the hose clamps to attach the spring clip to the pole. The stick clip is ready to go to work. If you bought a Trango Squid just screw it onto the threads at the end of the painter’s pole. You don’t need to buy hose clamps or use a screwdriver. It’s that easy. First put a draw in the spring clamp. Make sure it is oriented the way you’ll want it once its clipped to the first bolt. 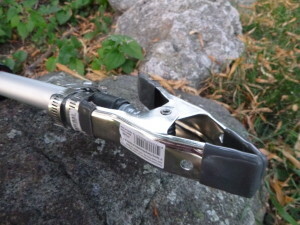 Clamp the draw in the spring clip. You can also hold the gate open while you clamp it so that it is stuck open (not shown). Depending on how far away the draw this and how good you are at stick clipping this can be make things easier. Then thread the rope through the draw. Make sure that the rope is going to be coming out of the draw away from the wall and towards you so that it won’t be back clipped when it’s hung on the wall. Route the rope properly so that it will be coming out of the draw away from the wall and towards you when it’s hung. Then use the stick clip to reach up and clip the draw onto the bolt. It will take a few tries at first but it gets easier with practice. Try it on a close bolt to get the hang of it before the desperate attempt to clip a bolt that’s 15 feet up. Once the draw is clipped just pull down to release it from the stick clip. This video from Trango will show you how to use the Squid. Watch this before taking the Squid to the crag! Practice with the Squid before it’s getting cold and dark and you’re already late to work and you really need to get that draw back. The Squid is not intuitive even though it is very useful. What else can you do with a stick clip? 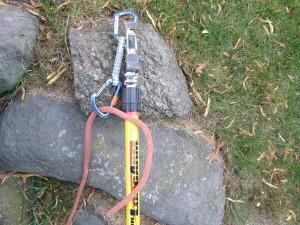 Rockclimbing.com goes into advanced stick clipping. Isn’t stick clipping cheating? No! Stick clipping is a decision that is up to each climber. Some climbers want more danger as they climb up to the first bolt and others want less (or none). Personally, sometimes I like being completely dependent on my climbing skills to keep me safe and other times I’m looking for a more chill experience. The stick clip lets me choose. Some may argue that climbing to the first bolt without being on belay is just bouldering. True, but typically sport climbing happens without pads and spotters, unlike bouldering, which makes it much more dangerous if you aren’t yet on belay. Some sport routes were even bolted with a stick clip in mind. 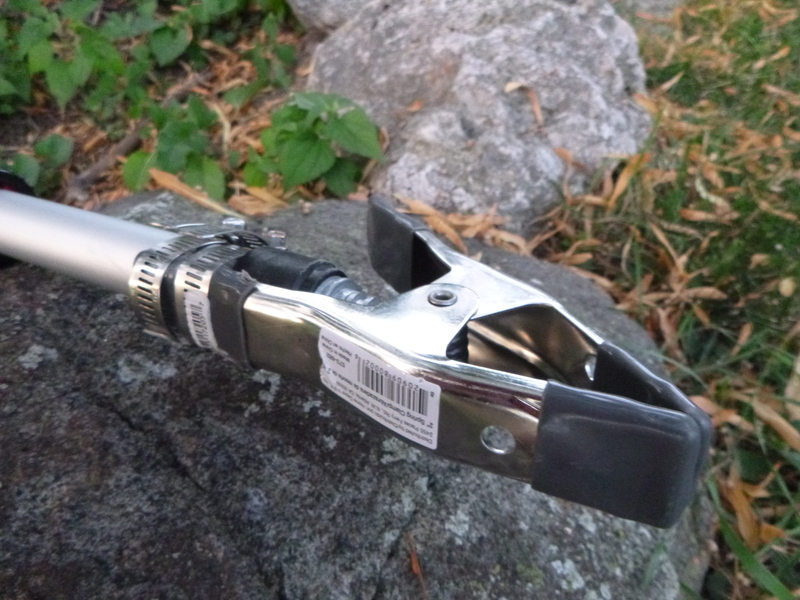 When you see a route with the first bolt at 10 feet or higher and every bolt after that at a five foot interval (10′, 15′, 20′, 25’…) the developer may have been expecting climbers to use a stick clip. Even if you don’t want to use the stick clip to start a climb it can still be useful to get the first draw down from failed climbs (assuming you have a stick clip with a Squid and not just a spring clip). When it comes to the ethics of stick clipping I recommend a “to each his own” attitude and an honest description of a climb was done (with or without stick clipping). Isn’t a 12′ Stick Clip Ridiculously Long? The Mr. LongArm 6′ – 12′ painter’s pole is definitely long. It doesn’t fit in car when I have four passengers and makes me look like Gandalf walking up to the crag (YOU SHALL NOT PASS!). I can’t strap it to my backpack. That said, I really like being able to clip and unclip draws that are way up the wall. And I’ve noticed an interesting pattern – the same people that look at me a little funny when I show up with the super long stick clip sometimes ask to borrow it later in the day. A few times I’ve even run into them again on a different day and noticed that they too now are now packing a mega clipstick. Haters gonna hate but most people seem to appreciate it or at least understand. What if I Need a Stick Clip and Don’t Have (or Can’t Afford) One? If you find yourself in the woods without a real stick clip you can always improvise. Find a long, sturdy stick. Tape the spine of the carabiner that will be clipped to the hanger to the stick using the minimum amount of tape. Now clip the draw to the hanger and pull down hard to rip the tape and separate the draw from the stick. Depending on the draw and the hanger you may find it helpful to prop the draw open with a stick. There’s even a way to do it using the rope in case you don’t have tape.